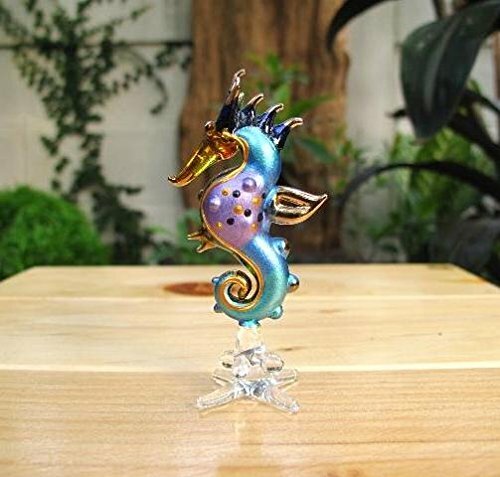 This Sea Horse Doll House Miniature by "We are Handmade" is best quality & special design with handmade & handpainted work. This figure has as adorable action. It is also made with high quality glass and outstanding detail as you can see on picture above. Measures L 1.5 inches X W 1.5 inches. X H 3 inches. Since it is handmade work so it may has a little different detail from picture. The items are not come from china. All of them are made by artisan of Thailand. !!Furthermore!! If you are finding a nice gift for your friend's birthday, grand opening,holiday greeting gift or decoration stuff, this is the right item for you. please leave a review and let us know about your experience with our products (We are Handmade's product). Measures L 1.5 inches X W 1.5 inches. X H 3 inches. Since it is handmade work so it may has a little different detail from picture.